The China-Mongolia-Russia corridor is one of the six major corridors envisioned by China’s One Belt One Road Initiative. The project seeks to improve infrastructure links between the three countries, reduce freight times, and create new sea and land-based export routes for Mongolian natural resources. It also aims to reduce bureaucratic barriers at the border and provide a shorter route for Russian freight to Pacific ports via Mongolia. Large finance inflows from China? 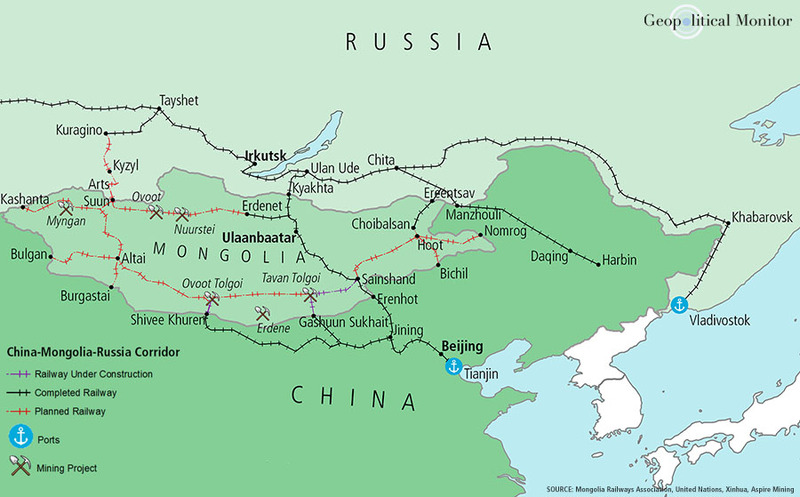 Mongolia has long sought to develop its national rail and road infrastructure, most recently with the government’s “Land Road” plan of 2013. Yet these initiatives have often floundered due to a lack of outside investment. Enter China’s One Belt One Road Initiative which, combined with the China-led Asian Infrastructure Investment Bank (AIIB), is primed to step in and offer much-needed finance in order to kick start stalled infrastructure projects. That’s at least how it is supposed to work in theory. In practice, the political establishment of Mongolia is worried about becoming too economically beholden to its powerful neighbor to the south. These concerns continue to hamper the rollout of the kind of spending levels seen elsewhere in One Belt One Road, such as the China-Pakistan Economic Corridor (CPEC).